The elaborately detailed wooden fence at Roseland Cottage is the first thing visitors see when arriving at the Gothic Revival property in Woodstock, Connecticut. A massive restoration project in the early 1990s addressed the entire fence. A little more than twenty years later, however, the fence is once again in need of attention. The intricate details provide many places for water to enter, making the fence particularly vulnerable to weather damage. It sits very close to the road and, during winter, is often covered with densely packed and salty snow pushed into piles by plow trucks. The combination of moisture, salt, and its own weight takes a toll on the structure. Historic New England’s preservation staff and carpenters devised a treatment plan that included a multi-year repair campaign, which began in spring 2012 with repairs to the North Gate. Each year, two sections of fence are removed and brought to the carpentry shop at the Lyman Estate in Waltham, Massachusetts, for repair over the winter. The repaired sections are reinstalled each spring. 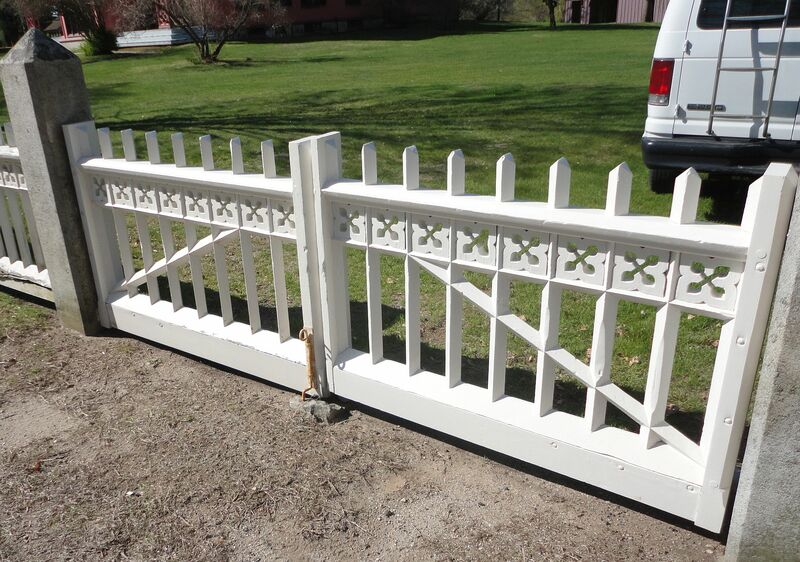 The recently repaired North Gate was struck by a car in fall 2013 and returned to the shop for more repairs. To date, four sections of the fence have been repaired, and the North Gate has been repaired twice. Two more sections are now at the carpentry shop for work over the coming winter. This project demonstrates how preserving a highly visible architectural feature requires considerable planning and resources. Please consider a donation to the Preservation Maintenance Fund to support essential preservation projects like this one. View a gallery of the repairs.